21 "Our 100 Days or Theirs?" 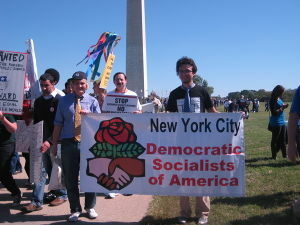 27 DSA May Day "bash"
New York City Democratic Socialists of America are affiliated to Democratic Socialists of America. James will become AG on Jan. 1, and Mayor de Blasio is expected to schedule the election for sometime in February.. The Steering Committee is the elected leadership of the NYC-DSA city chapter. The co-chairs, treasurer, secretary, working group coordinator, and membership coordinator are elected at the annual city convention. The branch representatives are elected by their respective branches. 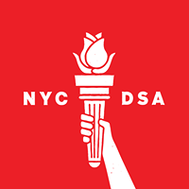 Congratulations to our newly elected New York City Democratic Socialists of America Steering Committee: Bianca Cunningham and Abdullah Younus (Co-Chairs), Joe Demanuelle-Hall (Secretary), Tiffany Gong (Treasurer), Leslie Fine (Membership Coordinator), and Cea Weaver (Working Group Coordinator). Photo: William Matelski. — with Aneesh Bhoopathy, Annie Shields, Julia Salazar, Aaron Taube, Dane Cardiel and Emmy Hammond. Sunday 17 January 2016, Organized by : Theater in Asylum and NY DSA the "Fourth Democratic Primary Debate Watch Party" was held at 192 2nd Ave, New York. Theater in Asylum, (which was founded in 2010 by Paul Bedard and Katie Palmer), with the NYC chapter of the Democratic Socialists of America, is preparing to create theatrical adaptations of the Democratic Primary Debates. With a small army of actors, designers, dramaturgs, and support staff, we will watch and analyze the debates, devise a piece, and present it live in NYC... join us for the first step in making it: a Watch Party! Those indicating attendance, on Wherevent included Camara McLaughlin, Lucy Myrtue, Alex Max Caring-Lobel, Jessie Bangarang Atkinson , Mandy Robbins, James Cajuste, Jeevan D'souza, Chelsea Langford, Alexis Roblan, Rick Fudge, Laura Aristovulos, Calandra Daby, Yonit Friedman, Leah Alfieri, Josh Youngerman. Serv Industry NYC-DSA closed Facebook group, accessed February 9, 2018. New York City DSA Labor & Strike Solidarity, Created group on December 13, 2017. New York City Democratic Socialists of America Red Diaper Baby Group closed Facebook group, accessed December 10, 2017. Kristin Lee, created group on December 9, 2017. CUNY Brooklyn. More names had been added by January 11, 2018. New York City Democratic Socialists of America DSA Car Caucus closed Facebook group, as of October 26, 2017. This group is for people in NYC DSA who have cars and people in NYC DSA who want rides to things. Creative Comrades (New York City Democratic Socialists of America ) Closed Facebook Group, as of September 1, 2017;. 1) Ask questions. 2) Talk about projects. 3) Pitch ideas. 4) Get advice. 5) Post jobs. 6) Collaborate. 7) Borrow gear. 8) Share resources. 9) Talk politics. Please keep conversations respectful and be mindful not to use sexist, racist, or classist language. If you see any inappropriate content, please message us immediately at media@dsa.nyc and we will resolve the issue. More members had been added by October 15. Oliver Rivard, Co-founder at Jake & Oliver Co.
Are you a socialist in the city? Join your comrades in the New York City Democratic Socialists of America. We’re part of the biggest socialist organization in the United States. Help us put democratic socialism on the New York City map! Daniel Wasserman, Mourning and grieving the loss of my Fathet at Retired, and loving life!! Jake Stevens, NYU School of Law. Created group on January 10, 2018. Ayesha Moni, Nalitabari Shahid Abdur Rashid Mohila College. Kenton DeAngeli, Works at Dots Inc.
Maddy Zimmerman, Works at Irena Hochman Fine Art Ltd. In 1990, the NYC DSA local gave out its Eugene Debs/Norman Thomas award March 21 at a dinner honoring David Livingston, president of UAW's District 65. Speakers included UAW International President Owen Bieber and Manhattan Borough President Ruth Messinger. Also honored was Steve Max, Curriculum Director at the Midwest Academy, who received the first Paul DuBrul Award for his critical role in developing the political strategies of the citizen action movement. In 1990 New York City Democratic Socialists of America's SA PAC endorsed Deborah Glick in her campaign to win the vacant Assembly seat in Greenwich Village. It also endorsed Jack Lester over Republican State Senator Roy Goodman, and DSAer Eugene Prosnitz, who was running for Civil Court Judge from the East Side. On April 23, 1991 Democratic Socialists of America brought together a crowd of at least 800 to the Riverside Church in New York City to hear Billy Bragg, Pete Seeger, Gretchen Reed, Robin Holcomb, and Kate McGarrigle and Anna McGarrigle. Amid the stunning atmosphere of the church, the performers entertained and inspired the audience with songs and stories of the struggle for social justice. DSA's Rafael PiRoman served as Master of Ceremonies and Manhattan Borough President Ruth Messinger introduced the event. The concert was sponsored by Youth For Jobs, Peace and Freedom, a project of the Institute for Democratic Socialism and the DSA Youth Section. New York City DSA endorsed 13 candidates in a crowded city council election. The local saw its vision of a progressive coalition In city politics realized by The Majority Coalition for a New New York, which organized an independent political campaign for progressive city council candidates. One candidate. Craig Miller, was a DSA member . In a hotly contested race in 1991 in Greenwich Village that divided many long-time allies in the progressive community, New York City Democratic Socialists of America picked Tom Duane, a progressive white gay man with a long history of community activism, over Liz Abzug, a progressive white lesbian. DSA judged her lack of activism in the community to be her fatal flaw. DSA also devoted significant resources to helping a DSA'er, Craig Miller, challenge ac long-time incumbent who had switched districts. We got on the phones, calling members that had been to the endorsement meetings or who had indicated interest earlier. We also sent postcards to almost all our members just before the primary, reminding them to vote for our candidate. In the end, some twenty DSA members were involved in the campaign of Guillermo Linares, a Dominican school board president running in an open seat in Manhattan. Members carried his petitions, coordinated volunteers, phonebanked, organized a fund raising party, and worked on election day. Contrary to the predictions of the political pundits, he won the primary by a 300-vote margin. Of the thirteen people DSA endorsed, eight won the primary and "will probably win the general election". (Democratic primaries virtually guarantee election in most of New York City.) Four won open seats, two incumbents won, two didn't face primaries and a fifth, surprisingly lost. All of the challengers DSA backed -- including Miller - lost. "Our 100 Days or Theirs?" On January 15 1993 New York City DSA held a forum entitled "Our 100 Days or Theirs?" at which the meaning of the Clinton victory for radical activists was discussed. Speakers included DSA vice chair Jim Chapin, Noreen Connell of the Education Priorities Panel, and Gale Brewer, the federal liaison for New York City. In 1993 New York City DSA worked in support of the re-election campaign of David Dinkins, and also on several Council elections, in the hope of boosting progressives' strength on that body. The New York City local's 1993 annual Debs-Thomas-Harrington dinner was held June 24. Honorees were Dennis Rivera, the president of Local 1199, and Deborah Meier, the co-director of the Central Park East Secondary School. During the fall of 1994 New York City Democratic Socialists of America sponsored a series of lectures on the history and meaning of Soviet communism. The series was led by D SA Vice Chair Jim Chapin, who then worked as a political adviser to New York City Public Advocate Mark Green. In 1995, New York City Democratic Socialists of America local's annual dinner was held June 7 and honored Jim Butler, the President of Local 420, the New York Municipal Hospital Employees Union, and Fran Barrett, founder and director of Community Resource Exchange. DSA and YDS members were especially active. Some got up “at the crack of dawn,” says Jeff Gold, to take buses to support Obama in various locations in Pennsylvania, sometimes side by side with experienced trade unionists from Working America and at other times with first-time campaign volunteers. They also worked with the social democratic Working Families Party, which ran much of the New York Democrats’ field operations, to help the Democrats win their first majority in the state legislature since the mid-1960s . DSA members living in rent-regulated housing in Queens and Long Island were especially active in behalf of pro-tenant Democrats on the WFP ballot line. Another member traveled all the way to south Florida to help turn out Jewish voters for Obama, especially during early voting, when it was easier to address problems at the polls. Many of the DSA members who reported their experiences said they enjoyed working with a wide variety of people and the opportunity to see the awesome Obama campaign machine in action. They were exhilarated by the unprecedented enthusiasm expressed by newly energized volunteers and voters. “I’m a seasoned volunteer of 25 years..., but it was different this time,” said one. They strengthened ties with local grassroots organizations, and helped to elect some progressives who, we hope, will support DSA’s Economic Justice Agenda. But to paraphrase FDR, now we have to get out and make them do it.